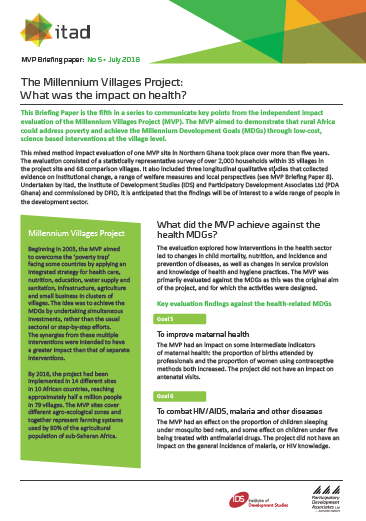 Millennium Villages Project Briefing Paper No.5: What was the impact on health? This Briefing Paper is the fifth in a series to communicate key points from the independent impact evaluation of the Millennium Villages Project (MVP). The MVP aimed to demonstrate that rural Africa could address poverty and achieve the Millennium Development Goals (MDGs) through low-cost, science-based interventions at the village level. The evaluation explored how interventions in the health sector led to changes in child mortality, nutrition, and incidence and prevention of diseases, as well as changes in service provision and knowledge of health and hygiene practices. The MVP was primarily evaluated against the MDGs as this was the original aim of the project, and for which the activities were designed.